Claddagh wedding bands are offered in either sterling silver or gold along with an unique assortment that are combinations. 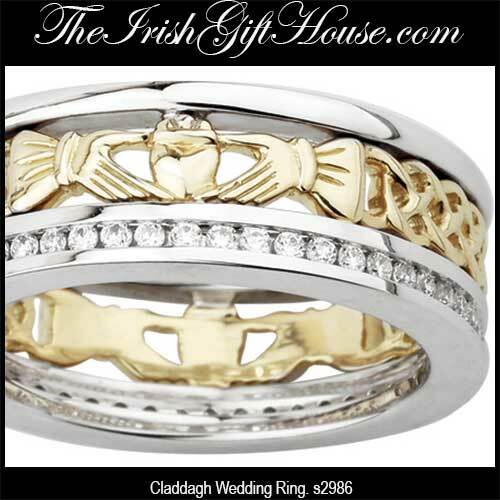 Claddagh wedding rings are available for all tastes and price ranges. Love, Loyalty and Friendship are the enduring expressions of these Claddagh wedding rings that are available for both women and men. Some of our Claddagh wedding bands have engraved Celtic knots, the words love, loyalty and friendship, or the Irish words Mo Anam Cara on the bands. Celtic knots on a Claddagh ring represent eternal love and the Irish Mo Anam Cara translates to My Soul Mate in English. Each Claddagh band is handcrafted in Ireland and hall marked by the Irish Assay Office at Dublin Castle. Your Claddagh wedding ring is received gift boxed with the Claddagh legend and with the Galway folklore that explains how to properly wear your ring. Please note that many of the Claddagh wedding rings pictured on this page in yellow gold are available as white gold and vice versa. Additionally the two tone gold Claddagh bands are also available in the reverse combination of the ring pictured as the sample image. Please use the available drop down to select your choice of gold color. 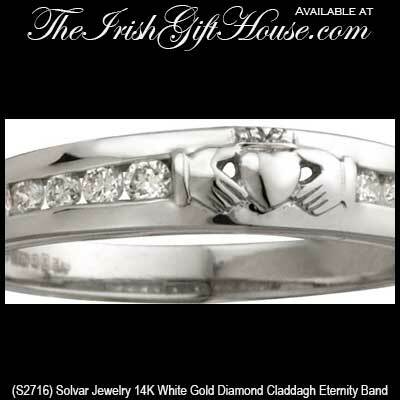 This Claddagh wedding band is available as either a white gold or a yellow gold ring. This men's Claddagh wedding band with Celtic knots is available as either a white gold or a yellow gold ring. This women's Claddagh wedding band in white gold features diamonds on both sides of the Irish symbol. 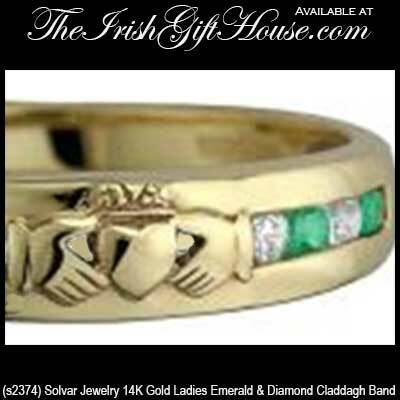 This women's Claddagh wedding ring in 14K gold features both emeralds and diamonds in the band. 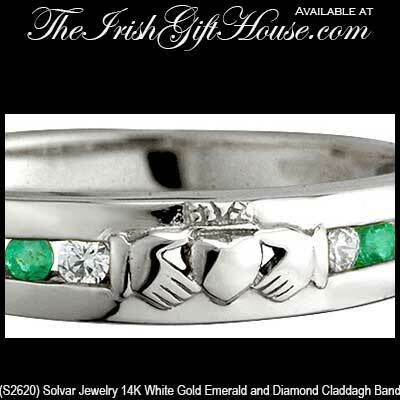 This women's Claddagh wedding ring in white gold features both emerald and diamonds. 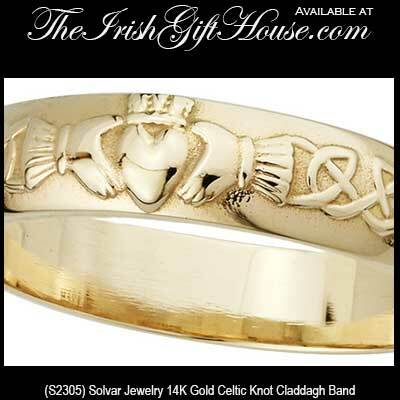 This women's 14K yellow gold Claddagh wedding ring features engraved edges around the band. Any Claddagh ring may be worn as a wedding ring, it does not need to be a band style. 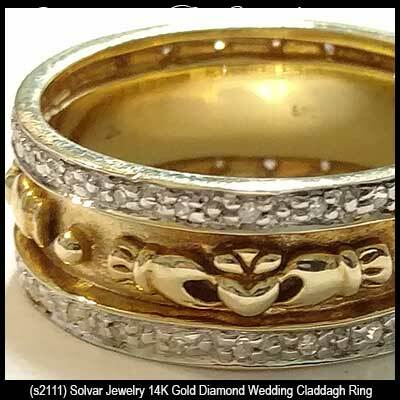 Please take a look at our gold Claddagh rings and men's Claddagh rings if you would like to consider some additional choices for a Claddagh wedding ring. You may also wish to browse our assortment of sterling silver Celtic wedding bands or the combination gold and silver Celtic wedding bands; there are just two of the ten related categories that also include Trinity wedding bands. 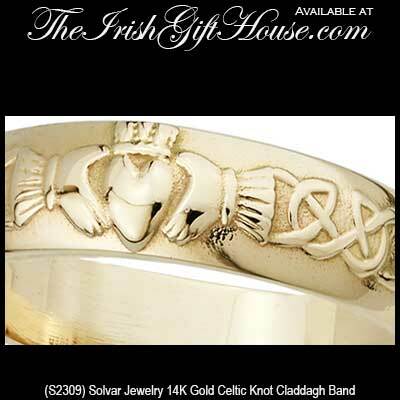 The Claddagh rings and bands offered at The Irish Gift House are made in Ireland by Solvar, TJH or O'Connor Jewelry.